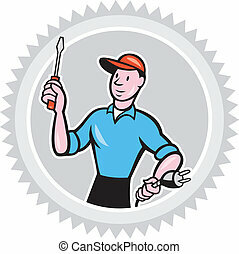 Electrician standing screwdriver circle cartoon. 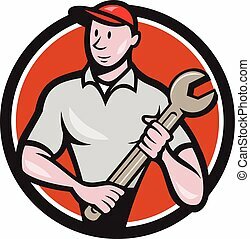 Illustration of an electrician worker holding a screwdriver facing side on isolated white background done in cartoon style set inside a circle. 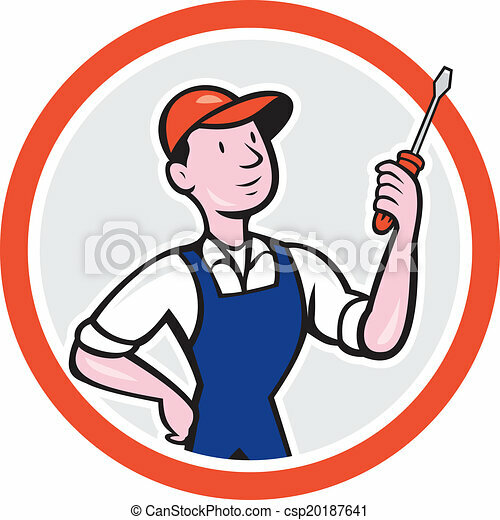 Illustration of an electrician worker holding a screwdriver facing side on isolated white background done in cartoon style set inside a circle. 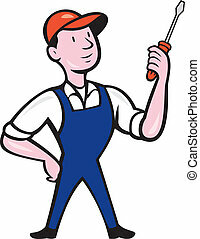 Illustration of an electrician worker holding a screwdriver facing side on isolated white background done in cartoon style. 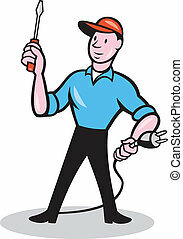 Illustration of an electrician worker standing holding screwdriver and electric plug on isolated white background done in cartoon style. 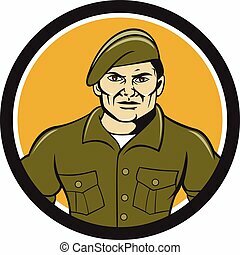 Illustration of a service ranger standing in full attention viewed from front set inside circle on isolated background done in cartoon style. 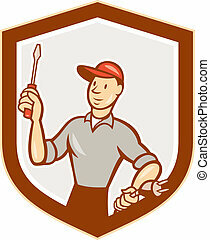 Illustration of an electrician worker holding screwdriver and electric plug set inside shield crest on isolated white background done in cartoon style. Illustration of an electrician worker holding screwdriver and electric plug set inside rosette shape on isolated white background done in cartoon style. 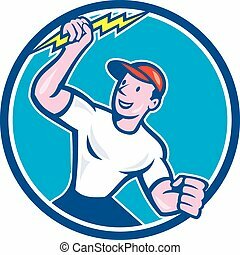 Illustration of an electrician construction worker standing holding a lightning bolt looking to the side set inside circle done in cartoon style on isolated background. Illustration of a mechanic worker standing looking to the side carrying spanner viewed from front set inside circle on isolated done in cartoon style. 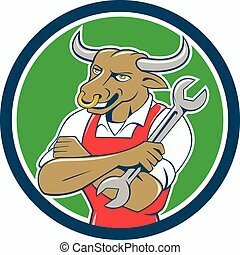 Illustration of a bull mechanic standing with arms folded looking to the side holding spanner set inside circle on isolated background done in cartoon style. 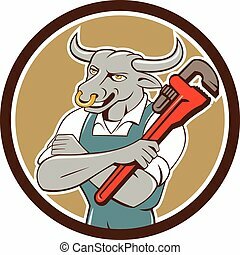 Illustration of a bull plumber standing with arms folded looking to the side holding monkey wrench set inside circle on isolated background done in cartoon style. 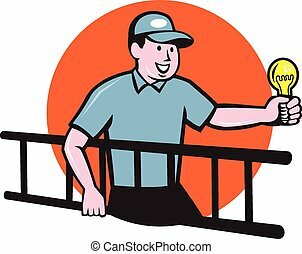 Illustration of an electrician worker carrying ladder on one hand and holding a light bulb in the other hand facing side set inside circle on isolated background done in cartoon style. 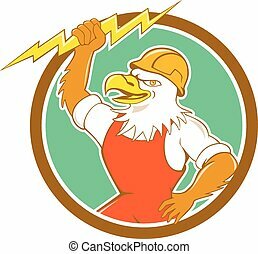 Illustration of a bald eagle electrician wearing hardhat holding lightning bolt viewed from side set inside circle done in cartoon style. 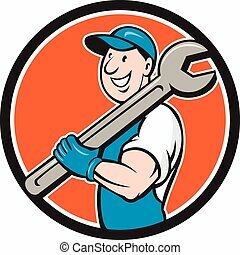 Illustration of a mechanic smiling holding spanner wrench on shoulder set inside circle on isolated background done in cartoon style. 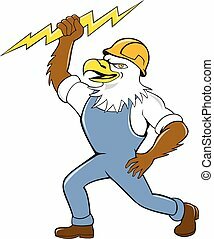 Illustration of a bald eagle electrician standing wearing hardhat holding lightning bolt viewed from side set on isolated white background done in cartoon style. 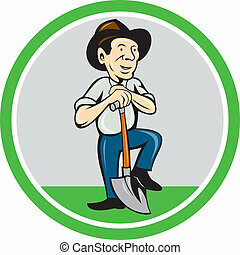 Illustration of AN organic farmer standing with shovel facing front set inside circle done in cartoon style. 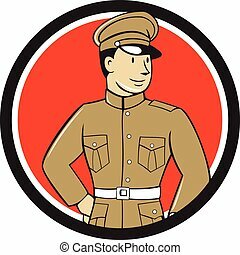 Illustration of a World War one British officer soldier serviceman standing looking to the side viewed from front set inside circle on isolated background done in cartoon style.